Back in 1989, Stanley Pons and Martin Fleischmann stunned the world by announcing a new form of fusion that could take place at nearly room temperature. That's not particularly cold, but it's much colder than the temperatures of the sun, fusion bombs, and most controllable fusion proposals. 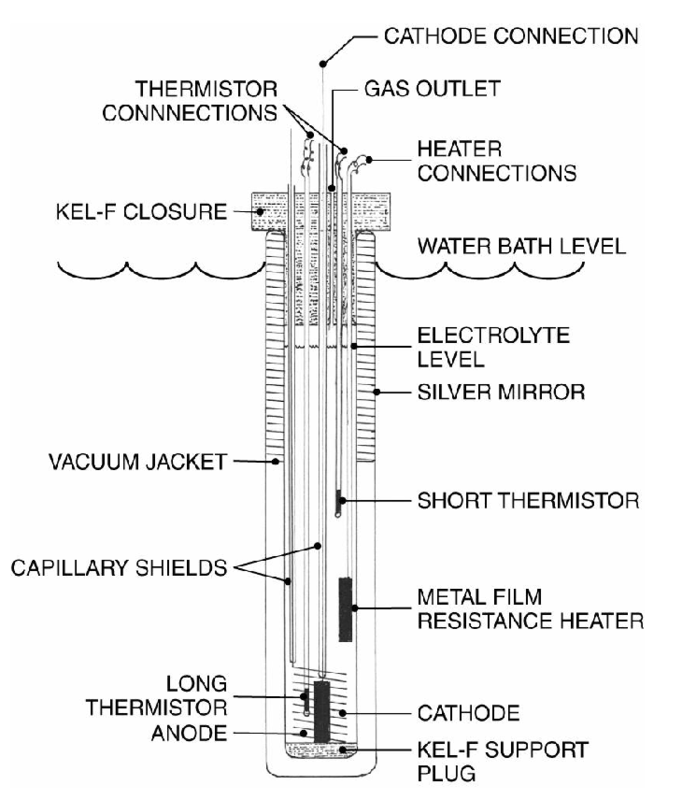 On March 23 in '89, cold fusion was born. I still have a copy of the very first paper Pons and Fleischmann released. It had been faxed (yep faxed!) from lab to lab in universities across the US and around the world. Many technical details were omitted, presumably because the cold fusion pioneers were eager to turn the revolutionary discovery loose to make the world a better place. In honor of a quarter century cold fusion research, I've compiled the top ten advances in the field since that momentous spring day. A new paper from researchers at the Australian National University is making waves in physics this month; the group claims to have developed a “tractor beam” of sorts. However, as is usual for claims of science-fiction technology made real, there’s a catch—it won’t be useful for pulling in rogue spaceships, but it might one day find applications helping guide the path of steamships. The report details the creation of never-before-seen flow patterns using waves on the surface of water in a shallow tank that, paradoxically, draw objects toward the wave source. Counter-spiraling whirlpools create an axis along which floating objects will be drawn in. The water is ejected laterally, in the chaotic squiggly region. The new technique relies on mechanically-driven buoys that oscillate up and down at a certain frequency to create stable whorl-like patterns of flow, which draw in surface particles from a particular direction. By changing the shape, size, and oscillation speed of the buoys, the team managed to create a variety of flow patterns, one of which displayed the unique pulling effect described in the paper. The most effective “tractor beam” arrangement used a cylindrical oscillator, oriented like a floating log, to make standing waves. While plane waves (below, left) can only move objects away from the source, under the right circumstances they can reflect off the boundaries of the tank to create peaked, three-dimensional waves (below, right), which lead to the unprecedented phenomenon. Plane waves extend to the edges of the container laterally, but the more exotic waves created in this experiment are described as fully three-dimensional. Further experiments with different buoy shapes led to the creation of unexpected and interesting flow dynamics, which may lead to advances in the study of fluid vortexes, but only the cylindrical oscillator produced the reported pulling effect. And while it is difficult to imagine finding a large body of water with conditions suitable to recreate the experiment, the paper's authors hope that the work may someday see use in the containment of oil spills and other surface contaminants. Bizarre flow dynamics emerge when a conical “plunger” is used. All images credit H. Punzmann, et al, Australian National University. This week on the Physics Central Podcast, we have our monthly news round-up. It's a mostly space-themed show this month. First up, the biggest astronomy news of the summer: after 10 years of travel, the Rosetta spacecraft has finally reached the comet 67P/Churyumov-Gerasimenko. Rosetta will be the first space craft to study a comet up close and for an extended period of time. In other news, could the Brazil-nut effect be responsible for speckled asteroids? Is there a new dark matter signal out there? And finally, why would an atomic clock on board the International Space Station measure time differently than on earth? Listen to the podcast to hear answers to these questions and more. By the way, you can now send your deceased pet's ashes to space. (Inside Science) -- Woodpeckers are some of the most industrious birds in nature. Their intense tapping -- all an elaborate effort to procure food -- can happen as rapidly as 20 pecks per second, with each strike transmitting a seemingly brain-rattling force of up to 1,200 times the force of gravity at Earth's surface. Yet, despite those repetitive impacts, woodpeckers typically show none of the typical signs of head trauma. How do their brains endure this? Their remarkable ability to absorb shock has made woodpeckers a favorite species to study for biology-inspired materials and design. Now, a new analysis shows that the bird's body stores most of the energy created in the pecking – and the understanding could lead to better helmets, cars or armor. Wu Chengwei, a mechanical engineer at Dalian University of Technology in northeastern China, used CT scans of the birds' bodies to create a precise 3D model of the creature. Working with colleagues, he ran computer models and found that 99.7 percent of the energy generated in pecking was stored in the form of strain energy, which spread out the force over the bird's body. Only a tiny leftover fraction of the energy went into the bird's brain. A Better Way to Build a Pyramid? The Egyptian pyramids are some amazing works of engineering. The biggest, the Great Pyramid at Giza, held the record for nearly 3,800 years as the tallest man-made structure in the world. What's astounding is that each limestone and granite block weighing up to eighty tons had to be dragged from quarries miles away, then hoisted up to 400 feet before finally being laid in place. Doing that for one stone takes an immense amount of manpower; repeating that for hundreds of thousands of slabs boggles the mind. The archeological consensus holds that huge crews of workers dragged the immense stones on sleds. Maybe they should have tried rolling the stones is what Joseph West of Indiana State University is proposing. He and his undergraduate students Gregory Gallagher and Kevin Waters posted an idea on the ArXiv the other week for a simple way to roll a rectangle. Aspirin’s Form I has a structure that is more robust all-around, whereas Form II is strongest along one axis and weaker on others, making the second version less stable. Scientists in Berlin have just cracked the case on a recently-raised question about one of the world’s most popular medicines: aspirin. By taking into account previously-overlooked forces, which only have significant effects at distances not much greater than the size of an atom, the team was able to explain why aspirin’s molecules favor one crystal structure over another. Before Neil deGrasse Tyson; before Bill Nye; before Beakman and Mr. Wizard; before Carl Sagan—there was Dr. Research. "Dr. Research" (real name Dr. Frank Baxter), was the star of the Bell Science Series, from 1953 to 1964. The Bell series was the first science show to incorporate good storytelling, humor and visual effects. Other science shows at the time basically consisted of someone giving a classroom lecture. In other words, the Bell Science Series set the stage for just about every entertaining science show that came later. 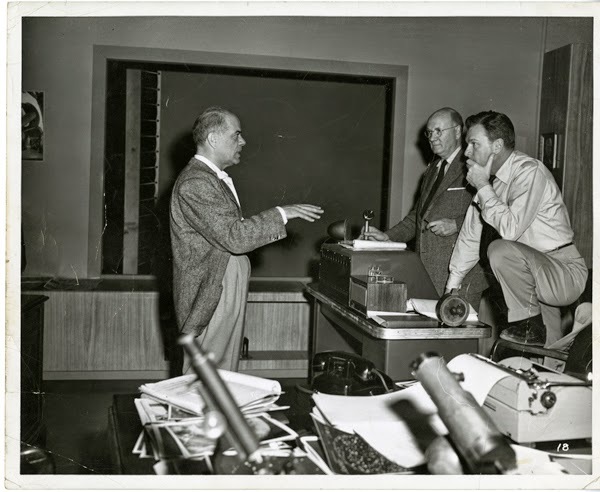 The drastic change in approach was largely thanks to the vision of Cleo T. Craig, head of ATT at the time, and Frank Capra, who directed the first four films (modern audiences will be most familiar with Capra's directing work on the holiday classic It's A Wonderful Life.) Even if you're too young to remember "Dr. Research" Baxter, his legacy is important to modern science television. This week on the podcast I talk with author and historian Eric Niderost about his book Sonnets and Sunspots: "Dr. Research" Baxter and the Bell Science Films. You can watch four of the Bell Science films online: Our Mr. Sun, The Alphabet Conspiracy, The Thread of Life, and Gateways to the Mind. 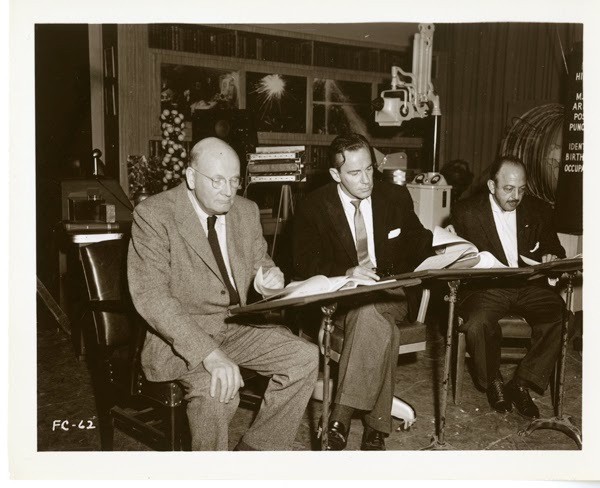 From left, Frank Baxter ("Dr. Research"), Richard Carlson (the second "Fiction Writer"), and voice actor Mel Blanc (a squirrel in Hemo the Magnificent, but you know him as Bugs Bunny, Porky Pig and just about every other Warner Brothers cartoon voice before 1980). Image courtesy of Wesleyan Cinema Archives, via Eric Niderost. Correction: I stated in the podcast that the first four of the Bell Science films are available to watch online. That's not the case. The four films that are available are linked above (they are the first, fifth, sixth and seventh films in the series); you can buy the second, third and fourth films on DVD. (Inside Science) -- Disappointed that your Transformers action figures can't transform themselves? Researchers have created real-life transformer robots that can fold themselves from sheets into walking pieces of motorized origami. These new inventions could one day lead to sophisticated machines that can be shipped in flat boxes like IKEA-style furniture that assembles itself at home, or unfold in outer space for exploration, or deployed into confined spaces such as collapsed buildings for search-and-rescue operations. Origami-based engineering could also lead to lightweight, ultra-tough materials that can alter their mechanical properties on demand, scientists added. Roboticist Sam Felton at Harvard University and his colleagues began investigating origami, the Japanese art of folding paper into complex structures, as a way to cheaply and quickly make robots. "When we tried folding robot designs by hand, we found it could take an hour even for an experienced user to do," Felton said. "So we decided to automate the folding so the robots could assemble themselves." New insights explain how respiration does not result in asphyxiation. Why don't we suffocate whenever we try to take a breath? An international team of scientists has used quantum mechanics – the science that usually deals with events at the level of the ultra-small – to solve this human-sized mystery. Looking to hitch a ride out of the galaxy? You might want to buy a ticket on a hypervelocity star. These speedy sprites travel between one and two million miles per hour—fast enough to escape the gravitational pull of the entire galaxy. All stars in the Milky Way, including our sun, are moving: they orbit around the center of the galaxy. But those stars are going nowhere near the speed of hypervelocity stars. How do they get going so fast? A massive black hole, of course. Listen to the podcast to hear more about the science, the history and the future of these fast moving fireballs. With the genre of science fiction, it can be fun to make comparisons between an imagined future and the current reality. A huge franchise in science fiction that seems rife for comparisons with modern technology is Star Trek. There have been various posts across the internet written about emerging technology inspired by Star Trek. But what about the technology we currently have in widespread use that's equal to or better than what's aboard the starship Enterprise? Image Owner/Creator: Paramount Pictures. Posted by Jorg to Memory Alpha under fair use. The fast answer: we don't have a lot that's leaps and bounds above what either Star Trek: The Original Series or Star Trek: The Next Generation imagined, but there are a few things that stick out. 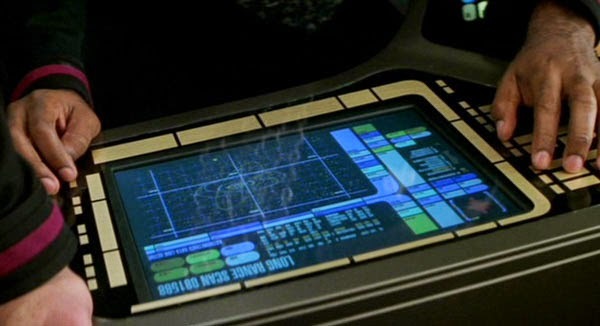 The bulk of the information about technology from Star Trek in this post come from Star Trek: Star Fleet Technical Manual and Star Trek the Next Generation: Technical Manual. It's back to school season, and for many aspiring graduate students, it's standardized testing season. Future lawyers have the LSAT; doctors have the MCAT; but many graduate programs require a more general test: the Graduate Record Examinations (GRE). Educational Testing Service (ETS), the company behind the GRE, administers a general test (with three sections) and a slew of section tests for areas ranging from physics to psychology. The general test remains the most popular of ETS's offerings among both test-takers and admissions officers. And each year, ETS releases more data about how test-takers fared based on their intended graduate area of study. As fans of friendly competition, we've compiled the data from the past three years into charts to arm those seeking bragging rights for their particular graduate school major. ETS has data for each section of the general test: Verbal Reasoning, Quantitative Reasoning, and Analytical Writing. After checking out the data, be sure to note the caveats at the end of this post. Note: Henceforth, any reference to "majors" or "students" (e.g. "philosophy major" or "economics student") will be referring to a student's intended graduate major because that is how ETS collects their data. 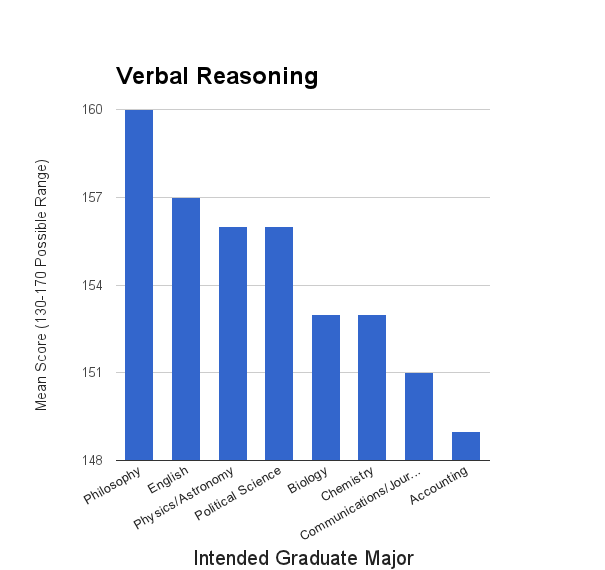 While one's intended graduate major often correlates strongly with one's undergraduate major, they are definitely not necessarily one and the same; there's more on this in the caveats listed at the end of this post. The verbal reasoning section primarily tests students' vocabulary and reading comprehension. When I reflect on taking this section, I fondly remember the esoteric words I had to learn, like soporific — meaning "causing or tending to cause sleep" and "of, related to, or marked by sleepiness." Admissions officers for degrees in the arts and humanities tend to place more weight on this section than on other sections. Data for tests taken between August 1, 2011, and April 30, 2014. These are simply a broad selection of intended graduate majors and do not necessarily represent the top 8 majors. For all intended majors, see the data courtesy of ETS. Philosophy, as in previous years, was a clear winner in this category; the next highest-ranked major — the "other" category under ETS's Arts & Humanities section — scored a full two points below philosophy on average. As a physics blog, we have to give props to the aspiring physicists out there who scored an average of 156 on this section, beating out all other hard science majors (and many liberal arts majors). For the verbal section, a 152 is the 50th percentile score, and the scores follow a mostly normal distribution. For reference, the average philosophy score on this section would be 84th percentile overall (the mean philosophy score was better than 84 percent of all test takers' scores).
. . . which is to say, they are not carcinogenic at all. 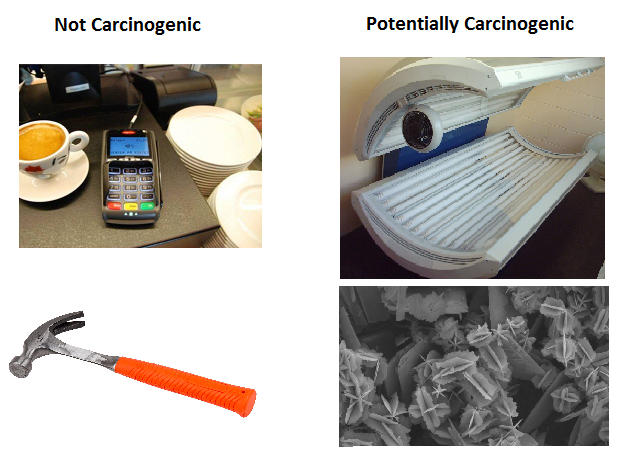 The analogy between the cancer risk that results from hammers and cell phones is better than you might imagine. I only bring this up because, once again, a prominent TV doctor who apparently has no understanding of physics is pushing the idea that "we just don't know if cell phones cause cancer" and that you should go out of your way to avoid the unknown risk. Well, Dr. Oz, that's simply nonsense. You may also just not know that gravity will continue to work tomorrow, and choose strap yourself to the ground out of an abundance of caution. Save yourself the trouble and the expense of your gravity-failure-prevention straps because, physics! Alan Alda started the Flame Challenge in 2012 to get scientists and science enthusiasts to explain complex topics to 11-year-olds. "What is a Flame?" was the first question, followed the next year by "What is Time?" The winner of this year's question, "What is Color?" was Dianna Cowern, aka Physics Girl, and we're talking to her on this week's podcast. (Inside Science) -- When a drop of liquid hits a solid surface, the liquid will do one of two things: flatten like a pancake or launch a halo of droplets into the air. It's a surprisingly complex and difficult-to-predict event. The secret is in the air. By taking into account the gas surrounding the drop, researchers find that they can calculate just how fast a drop can travel without splattering when it hits. A new study suggests that after the drop strikes a solid surface, a tiny cushion of air carries along its edge as it spreads. The air provides lift like on an airplane wing and flings away droplets from the drop's edge. "People have been working on this problem since the end of the 19th century," said José Manuel Gordillo, a mechanical engineer who studies fluid dynamics at University of Seville in Spain and coauthor of the study. "There was a big controversy about the physics behind the condition that determines the splash." Standing humans aren't particularly stable. As most martial arts practitioners know, it doesn't take much to knock a standing person down. That's because, when standing, your center of gravity is above the point where you touch the ground and your feet provide a relatively small platform. If you tip even slightly, your center of gravity is no longer over your feet, and you either have to take a step or fall over. If we aren't stable standing still, you might imagine that walking is that much more complex. 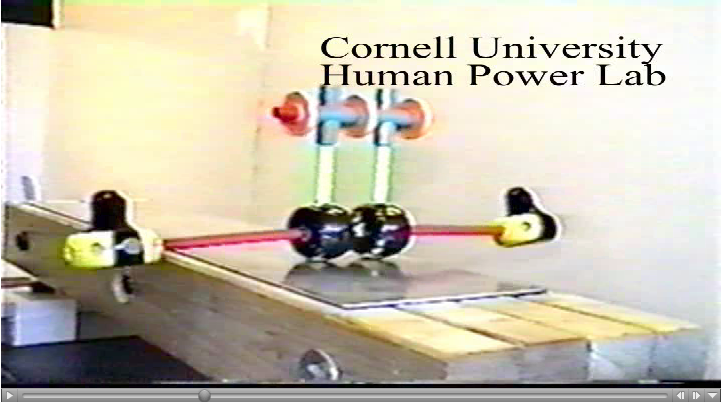 But a paper in Physical Review Letters back in 1998 showed that some things that can't stand still at all can walk just fine.